'An event that may not have got on the radar of East Norfolk Bus Blog was a Model Engineering Exhibition at Pakefield School last weekend. At the same time a Model Boat Exhibition taking place at the Kensington Gardens on the clifftop at Kirkley. 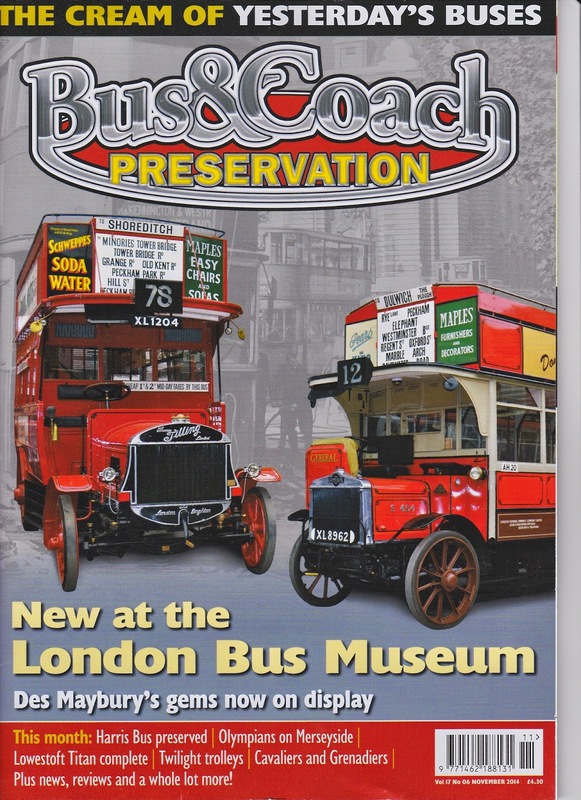 Linking the two locations was a service provided by a 1932 Sentinel S4 Steam Bus from Bressingham Steam Museum. I believe the bus forms part of the Saunders Collection and the bus previously ran on a route in the Lake district. Many thanks for the report and photos Tim and yes I didn't get to hear of the event! Daniel takes advantage of his slimness and height! sales of the magazine have rocketed. We all spent most of yesterday (Sunday) checking over her too, prior to having an MOT test shortly, and it is definitely a 'Big Boys Bus' when it comes to trying to reach everything in the engine bay...... a job made for Daniel as he is both slim AND a great length from head to toe so he can reach those far away bits! 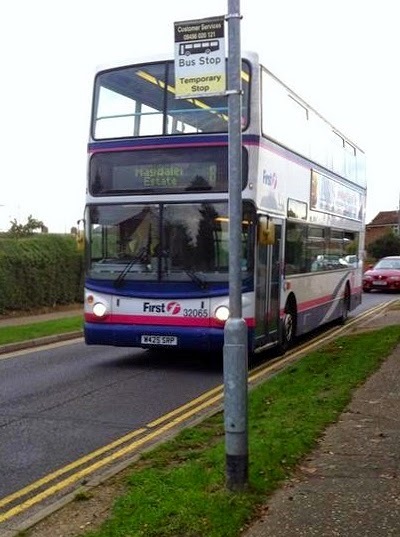 Perhaps the Lowestoft fitters had a bench to stand on and very long handled spanners! Need A Loan? Part Two ~ Syd To the Rescue! 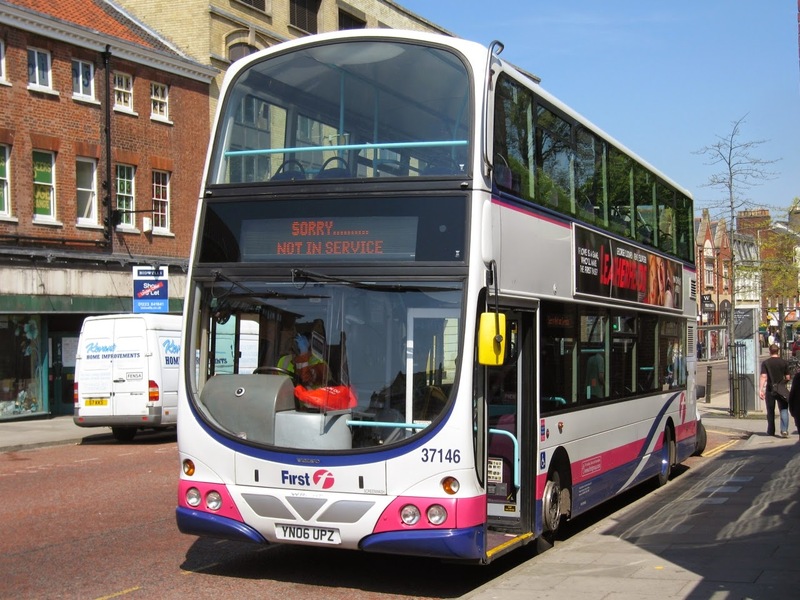 her running in Leicester in March 2010 and also had a ride back to the Railway Station. 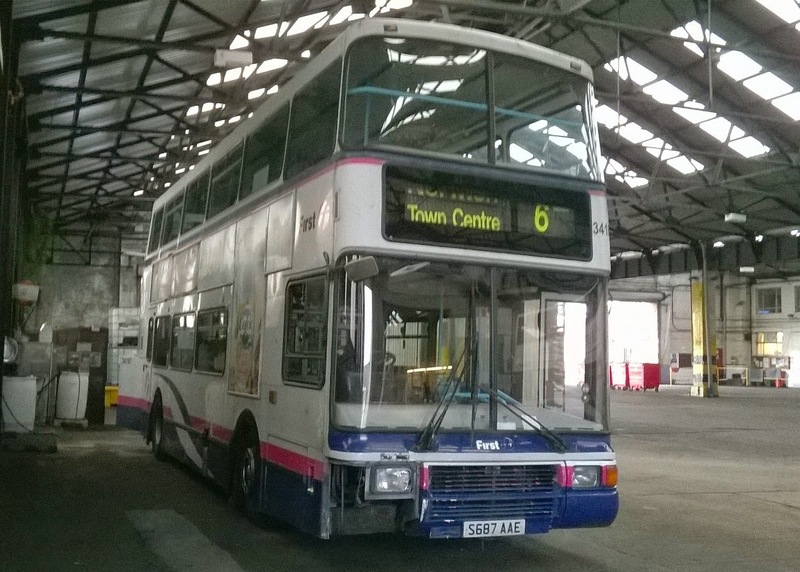 A total of three articles refer to operations in the Lowestoft area with the first concentrating on the restoration of Lowestoft's last Leyland - the Massey bodied Titan PD2 PBJ2F. 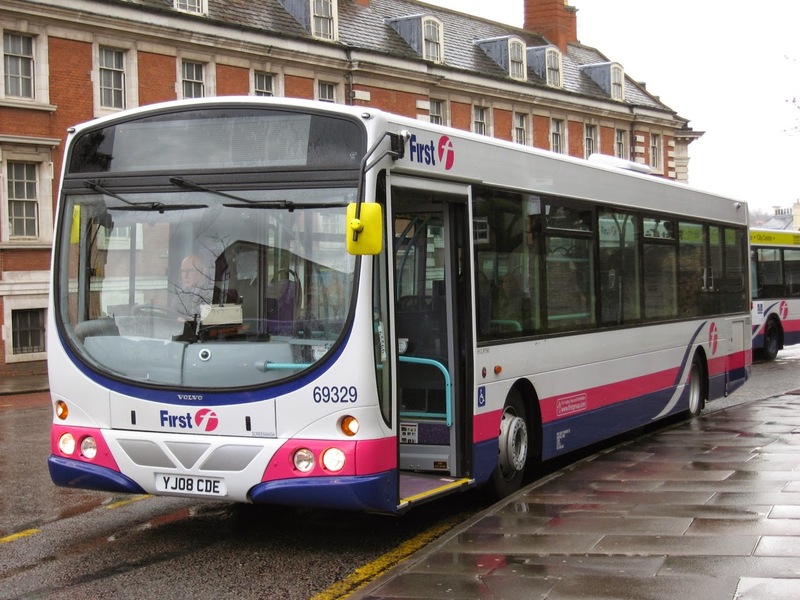 Part two of our special post regarding the changes to vehicle emissions in Castle Meadow, Norwich will show an assortment of First group vehicles that were loaned in to cover for modifications to the Eastern Counties fleet. 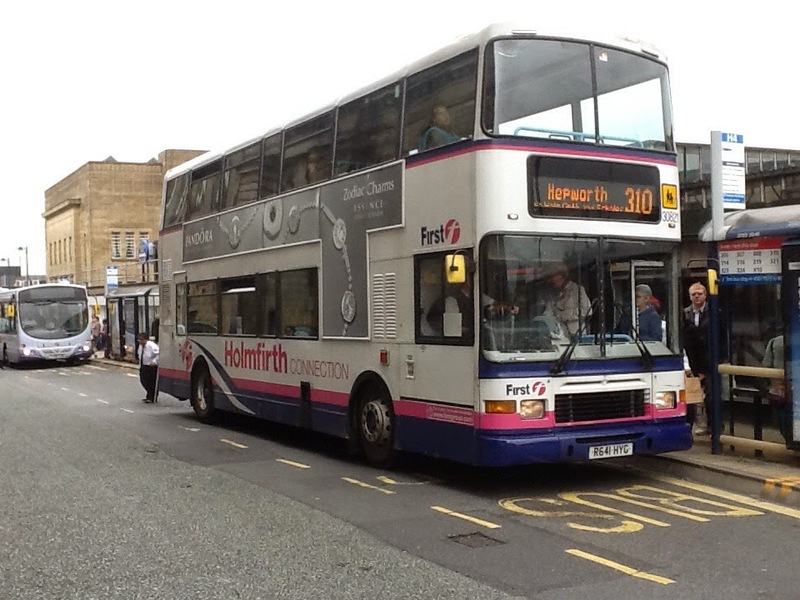 First West Yorkshire supplied Volvo B7L & Volvo B7RLE, the latter being brand new 69329-69331 YJ08CDE/CDF/CDK, the B7L's came from York and were 60903/5 YG02DHM/DHO & 60924 YG02DHE. 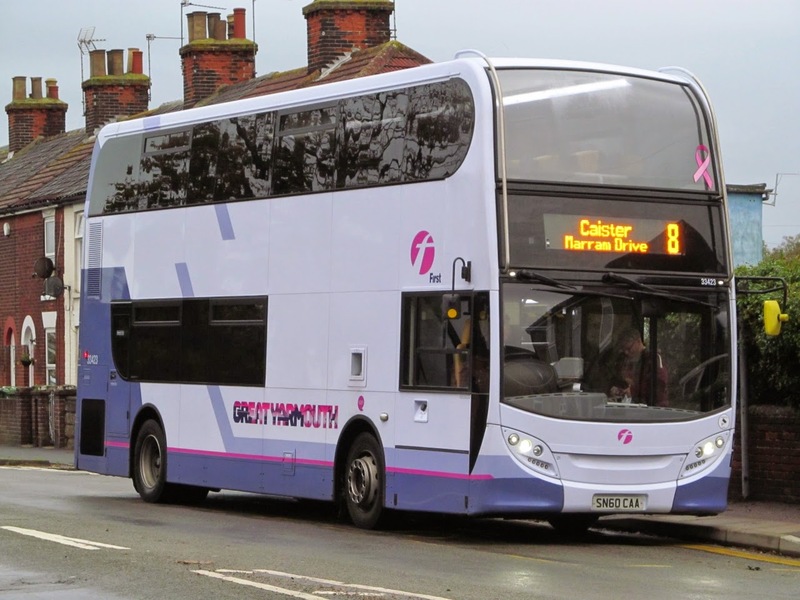 First Manchester supplied Volvo B7RLE 66932 MX55FHG which arrived by mistake at Caister Road in Yarmouth before making the trip up the A47. 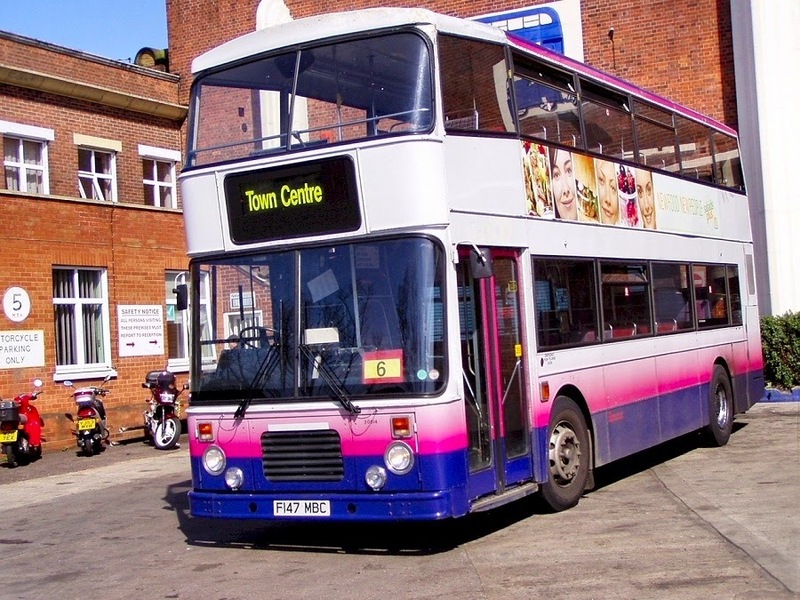 Leicester based Gemini 37146 YN06UPZ also arrived to assist but if memory serves me well it spent more time out of use than actually working, i pictured it whilst broken down outside Castle Mall in May 2008. 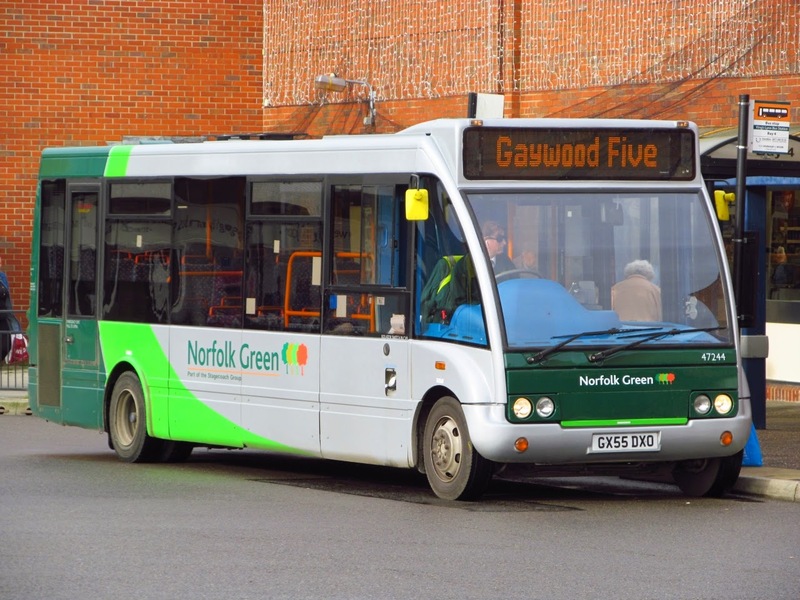 Another elusive vehicle which saw limited use whilst in Norfolk was First Glasgow B7L 61637 SJ51DHE, I never managed to capture her in use but David Waters did see her briefly working in Castle Meadow and let me have a copy of his photo. 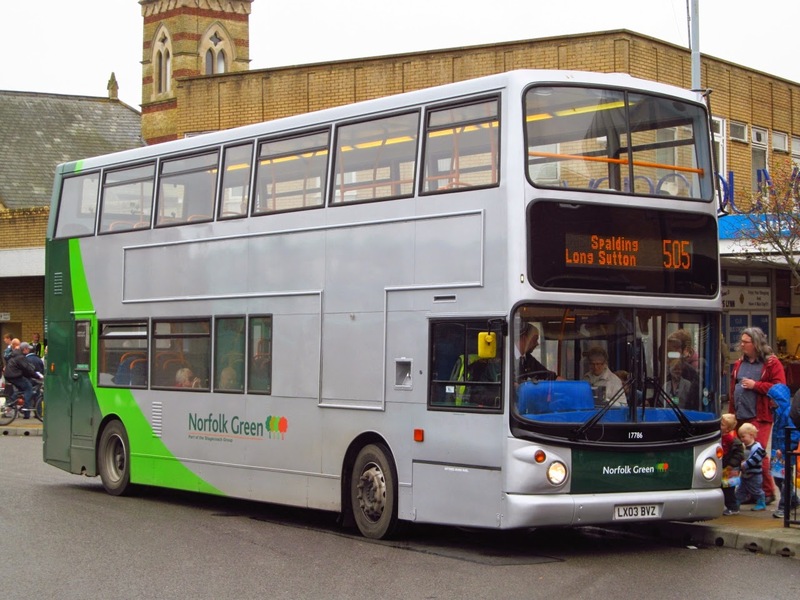 It was quite a busy time in Norwich, the batch of Volvo B7TL ALX400's 30886-30903 were arriving from West Yorkshire and started life with Eastern Counties in the city before visiting most, if not all of the depots at some time in their life within the company. 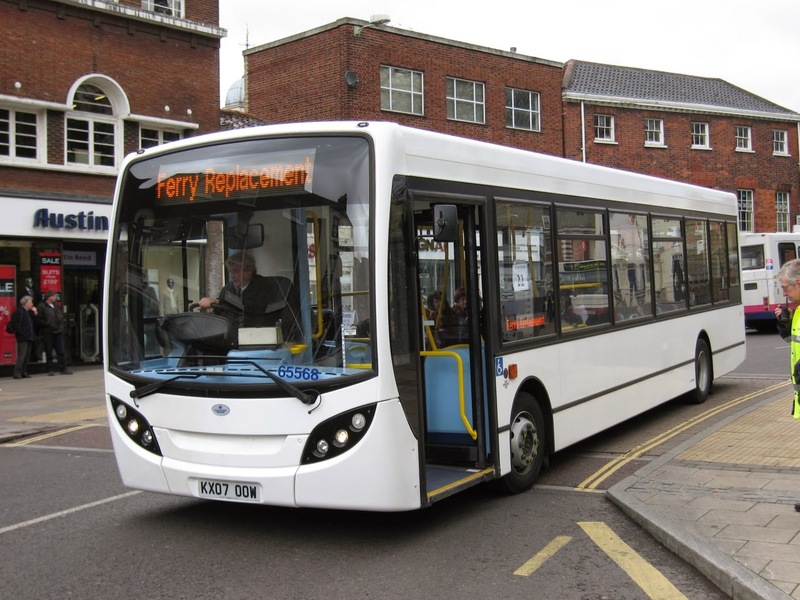 Two Optare Solo's arrived at Great Yarmouth 50273/50274 S304/305EWU also from Yorkshire with plans to use them on the 4 service in the town, but they were short lived due to reliabilty issues and they moved on to Ipswich. Back to Norwich and a few step entry Darts were still in use alongside an ever decreasing Olympian fleet, 2008 was certainly an interesting year for the camera in the city. 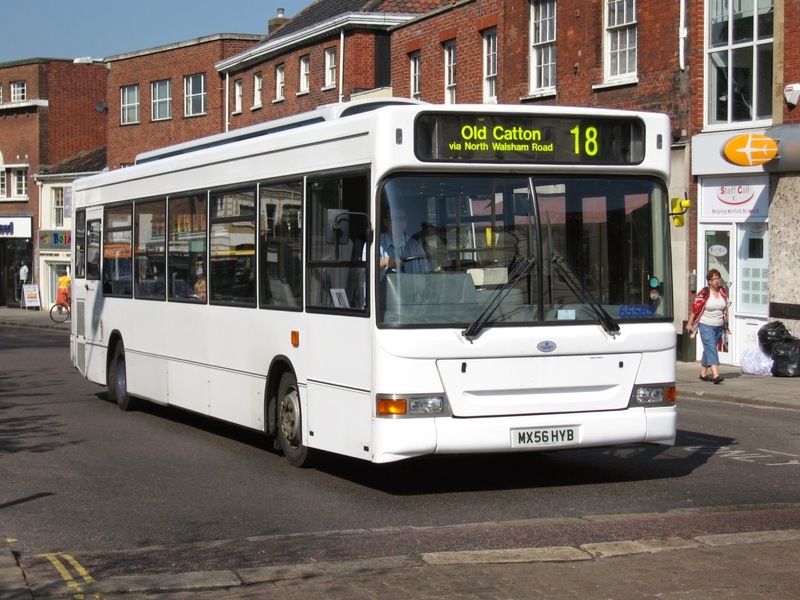 Early 2008 saw changes to the rules regarding vehicle emissions in Castle Meadow, Norwich. 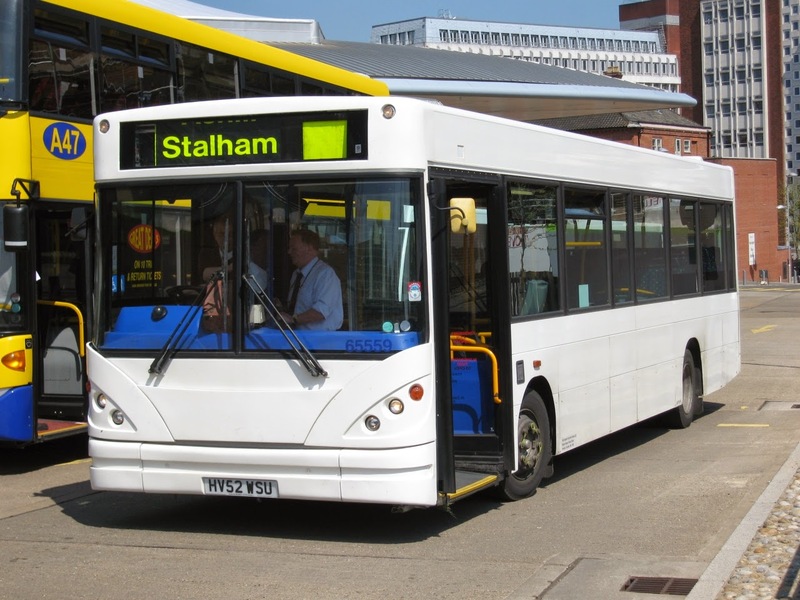 Eastern Counties begain sending their Scania single deck vehicles away for engine modifications to comply with the new regulations meaning various vehicles were loaned in to cover the missing fleet. Various different types were noted on the streets of Norwich , some noted carrying fleet numbers of the vehicles they were standing in for. 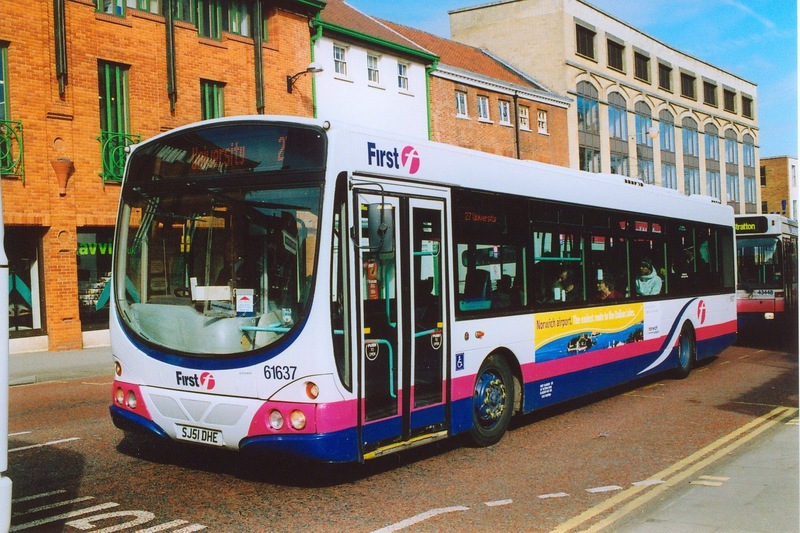 Other First Group companies supplied vehicles including First Manchester, Glasgow, West Yorkshire and Leicester. 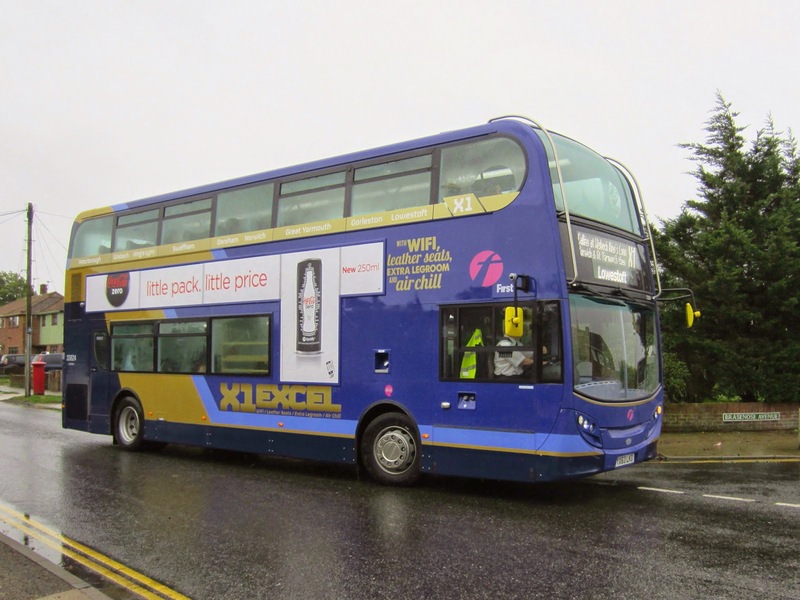 The first set of photos show vehicles that came from various dealer stock which included a pair of Alexander Enviro Darts KX07OOW/OOX which carried an array of odd destinations whilst in use as you can see from the photo of one of them! 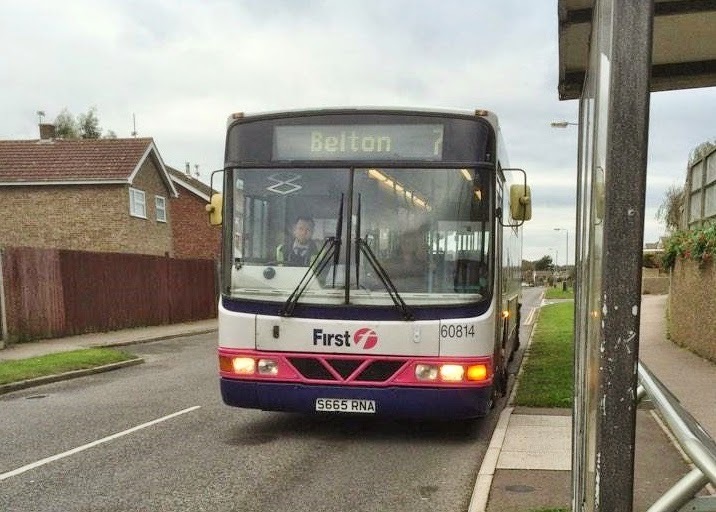 In the second part of this special post I will show some of the various vehicles from other First companies that were loaned in which included brand new Volvo B7RLE's from West Yorkshire, a troublesome B7TL Gemini from Leicester and a very elusive B7L from Glasgow! Part two will be online shortly! There has been some close calls recently with three passing him with the fourth turning up as a President or a Gemini! My thanks for the report Tim and hope you enjoyed your jackpot winnings!! Firstly, this is the 400th post on the blog this year and thanks to everyone who has contributed news items and photos to help us to attain this figure. We have already passed the previous highest annual total (obtained in 2013) and we are still only in October! And now the moan....... It has become apparent that some bloggers are copying news (and photos too) from this site without our approval - despite the copyright clause at the bottom of the blog! Often no mention is made of the information source and accordingly claiming it as their own. I would like to think imitation is the sincerest form of flattery! Rant over! 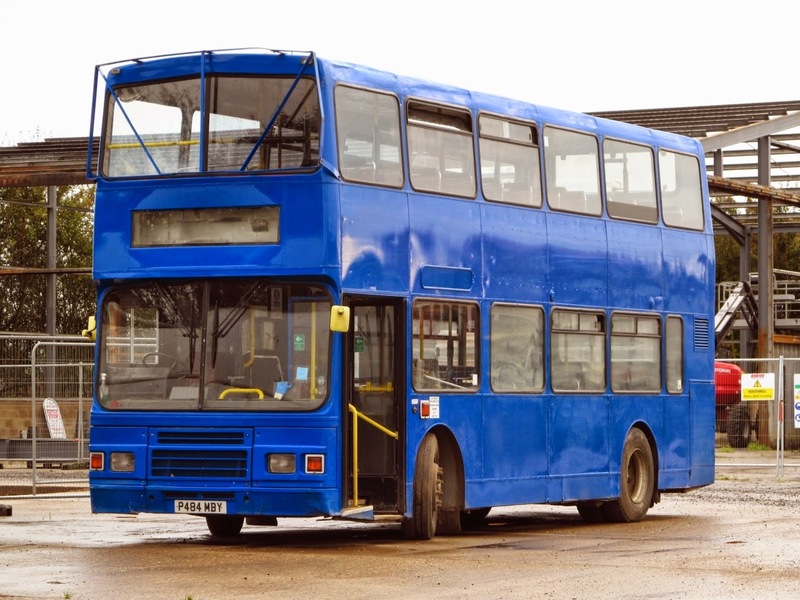 Two Blue Double Deck vehicles are currently transporting workers to Mill Farm in my home village of Ormesby St. Margaret. The first is GOX78V an Alexander bodied Volvo Olympian which has been converted to single door, unfortunately Google has no records of her history. 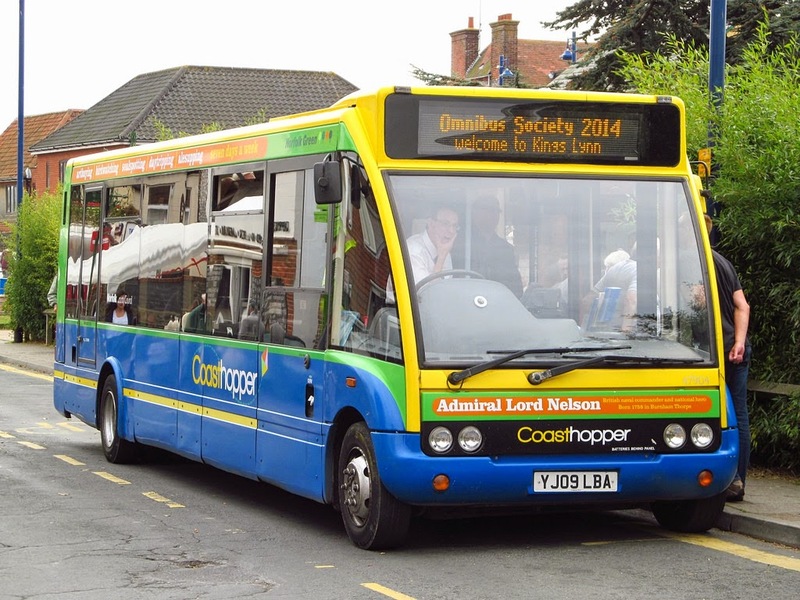 Metroline as their AV4, it then began its East Anglian life with Chambers of Bures in Suffolk. 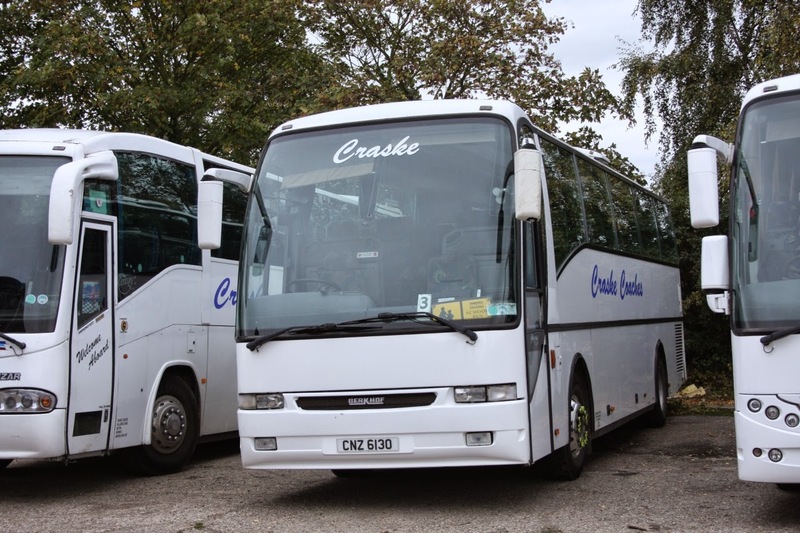 Both vehicles are now operated by G's Holdings of Soham in Cambridgeshire who operate a fleet of vehicles for this type of work. If I remember last year saw a variety of vehicles noted including A290TSN, which was also part of a blog post, I'm sure if you search the blog it will appear! Noted in Acle this afternoon was former Great Yarmouth Gemini 37572 which transferred to Lowestoft last month, it had been wearing Great Yarmouth names whilst operating from the Suffolk town and then a spell minus any, It is now carrying its new depot name on the drivers side only at present, seen here at the Kings Arms in the village en route to Yarmouth. A trip to Kings Lynn was the order of the day today to catch up with all the latest goings on in West Norfolk. Three ex Stagecoach London Tridents have recently been added to the Norfolk Green fleet and hoping to see them in action i was not disappointed with two of the three out in service, 17786 LX03BVZ & 17787 LX03BWA were seen in the Bus station on the 505 service between Kings Lynn and Spalding. Norfolk Green run all the local services in the town and connections to Norwich, Spalding and North Norfolk all leave from the Bus Station, a variety of vehicles are operated including Optare Solo,Tempo, Versa & Spectra models, ALX 400 Tridents and E400 Enviros plus recent Dennis Dart arrivals from Stagecoach Cumbria. Ex Norse Agoralines also remain in service at present. 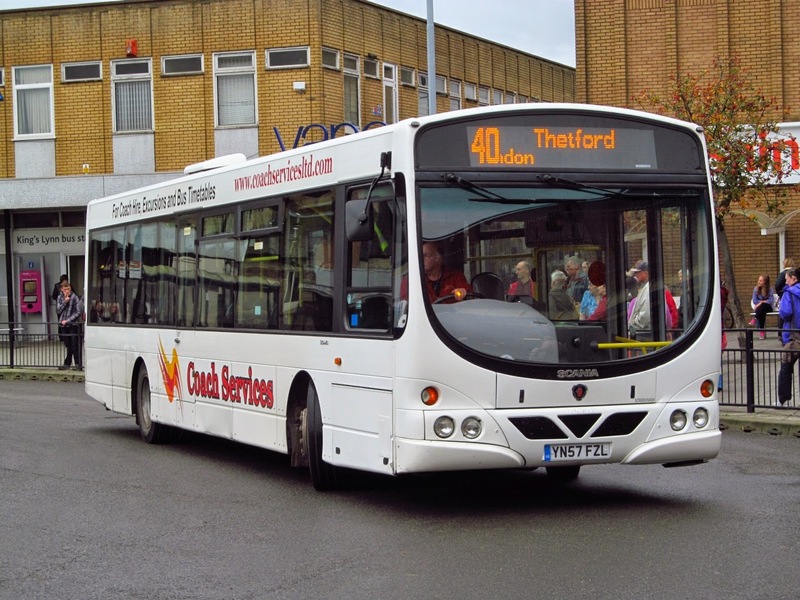 Other operators seen today were Konectbus who run betweem Watton, Swaffham and Lynn and also Coach Services of Thetford were seen using Wright bodied Scania YN57FZL on their 40 service. I Drove over to the Saddlebow Industrial Estate to seek out the yard where vehicles were being kept for new operator Coastal Red which is due to start operations soon, three Optare Tempos were noted including YJ55BKU and what i believe is a new arrival YJ05JWZ which last operated with Lloyds in North Yorkshire after spells in Wales, it is an ex demonstrator, another Red Tempo was also on site bit i was unable to ID it. 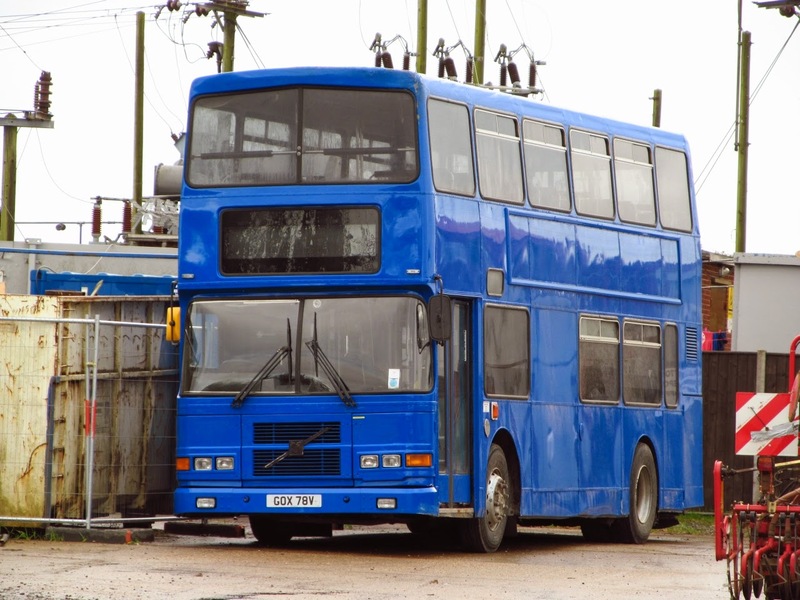 Last stop on my Kings Lynn Tour was Norfolk Green's Depot where all 4 on loan Olympians were noted as well as the third ex London arrival LY52ZDZ. 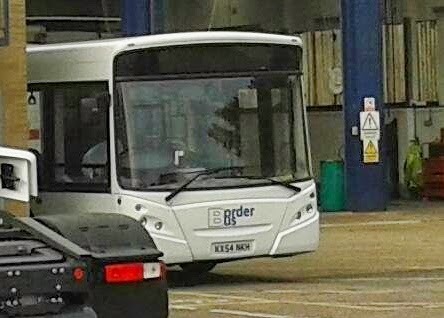 Driver Training Coach T667XYV also noted in the yard. 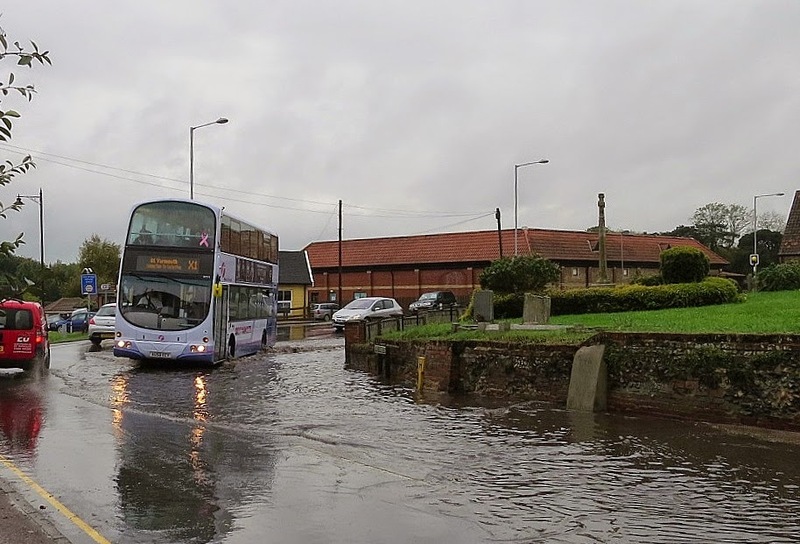 Regular contributor Jamie Skinner was quick of the mark this morning to photograph the early diversion of the 8 along Trinity Avenue - a similar shot to last weeks photo! 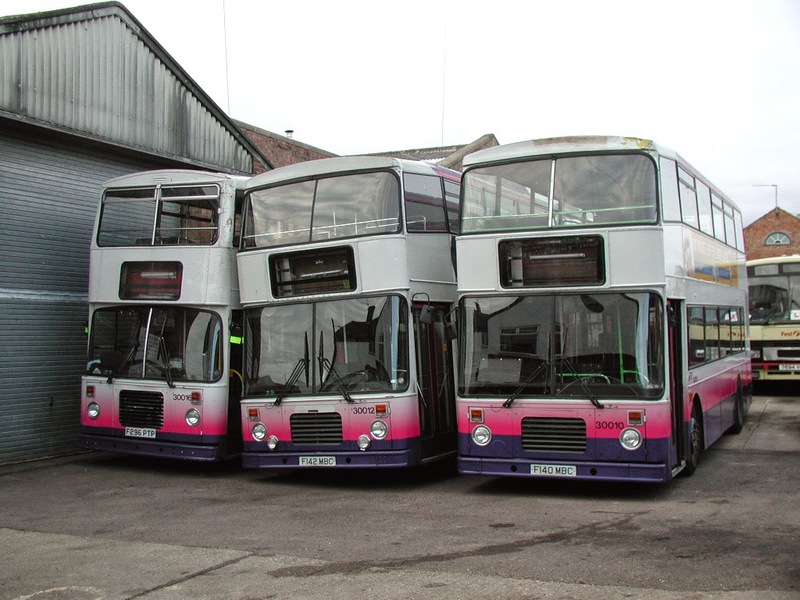 He confirms that First Huddersfield also has some Volvo Olympians in service - in fact ten of them! 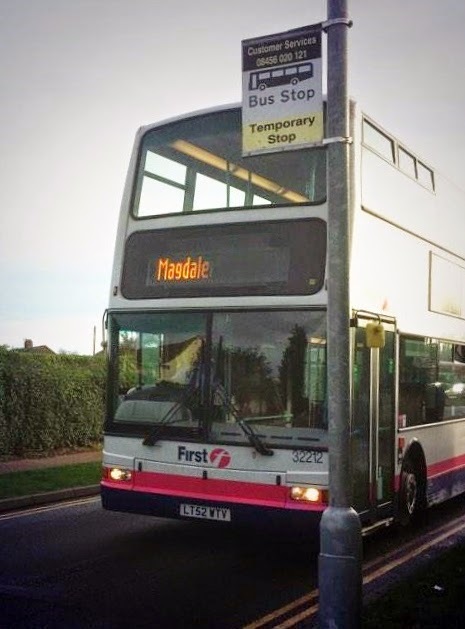 My thanks to Syd for the report and photo and I have some sympathy with his point of view; although I suppose any bus arriving is better than none at all! Regular contributor Tim Miller was at Ringwood services in Hampshire early yesterday morning and found a little piece of Suffolk nearby! He said that it still smells of fresh paint! 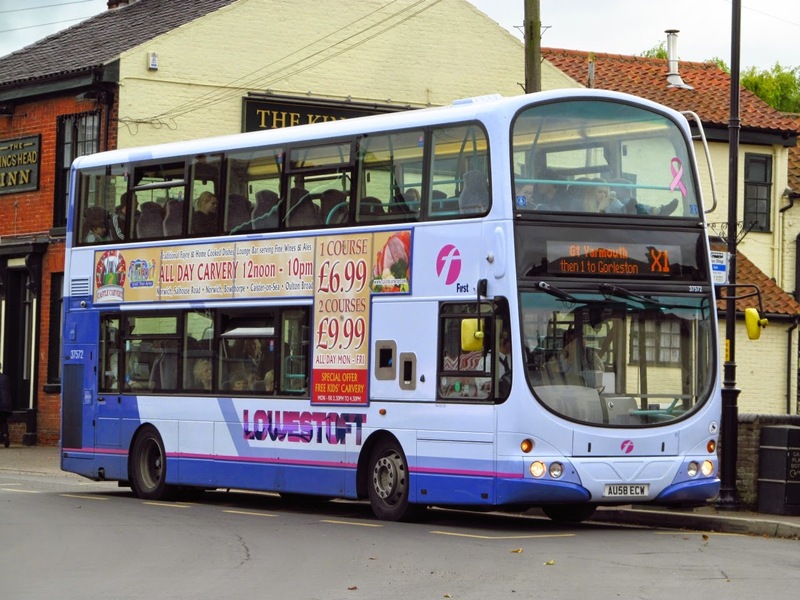 Fast becoming the most photographed bus in the Eastern Counties fleet, Enviro 400 33423 made a vary rare outing on the 8's this afternoon, pictured here on Yarmouth Road in Caister. 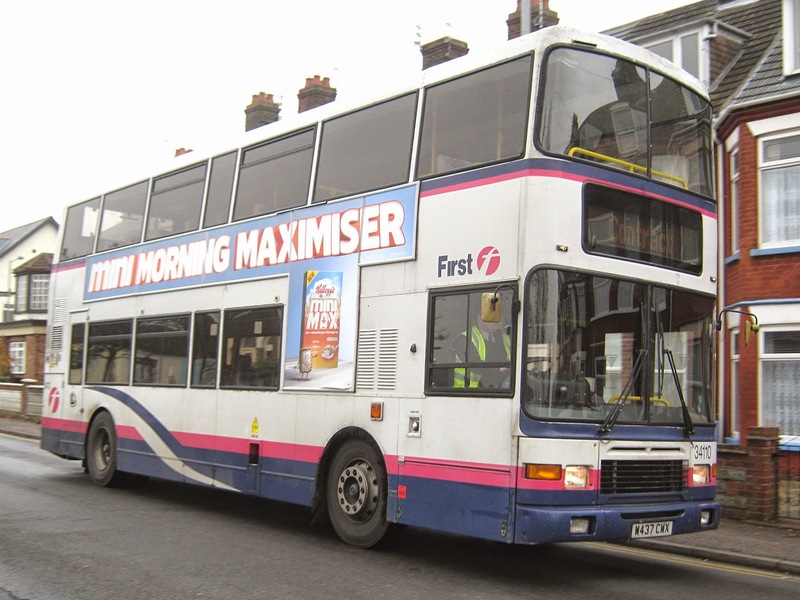 I passed her on her usual X1 working this morning in the town but was surprised as I followed her en route to Caister on my way home, so good job the camera was with me! After all the preparations to notify the public the work did not commence today after all; but First were not told until later in the day!! 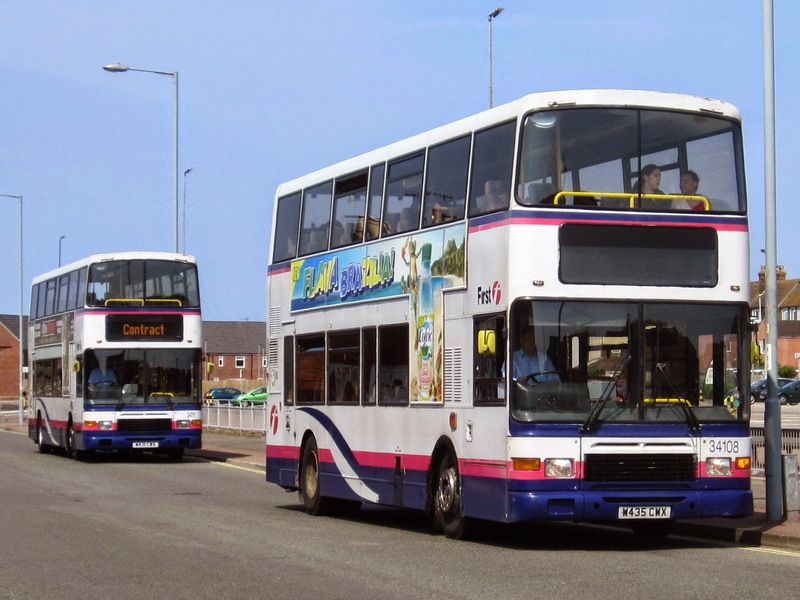 Summer 2004 saw the arrival of a batch of Dennis Dominators to Great Yarmouth. They arrived from First Leicester and were not the best to look at if im honest! All were in the short lived Barbie 2 livery, All had East Lancs bodywork similar to the two Volvo vehicles E40/41OAH operated by Great Yarmouth Transport although 30016 was slightly different in style. They finished their days being used mainly on Bernard Matthews contract work. Not one of my favourite's but they certainly earned their money when they were here. 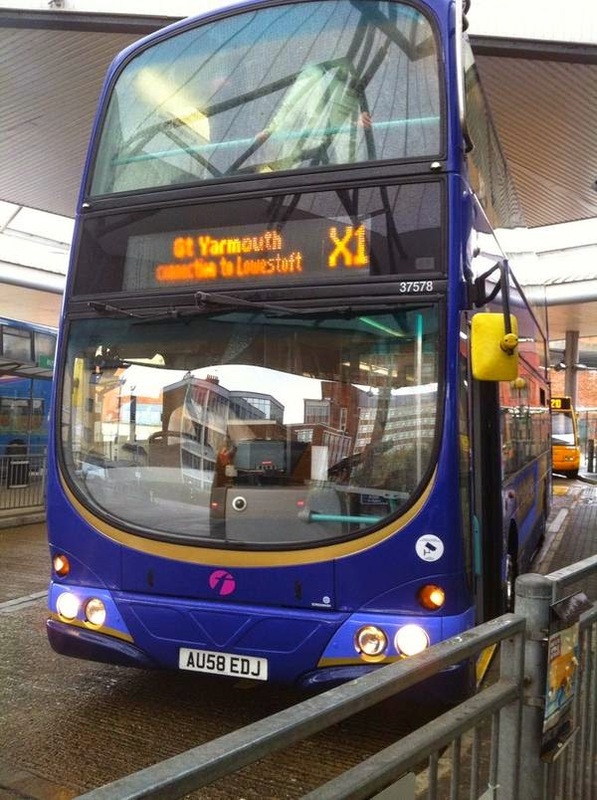 During that time, the X1 is to operate between Gorleston High Street and James Paget Hospital via Church Lane, Middleton Road and Lowestoft Road with all stops on Middleton Road being served. 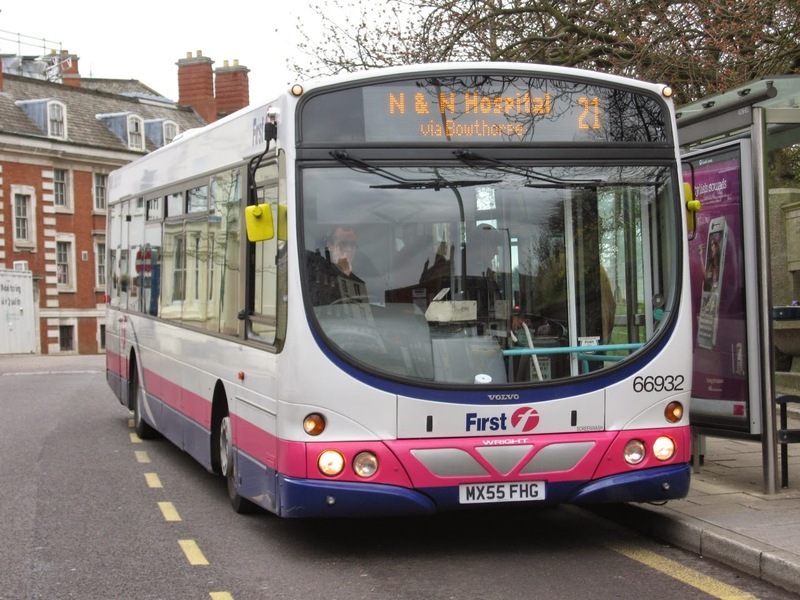 An additional shuttle service will run every half hour between Hertford Way and Gorleston High Street to allow passengers to transfer to other services. Any excuse to get a photo of 32423 on the blog! 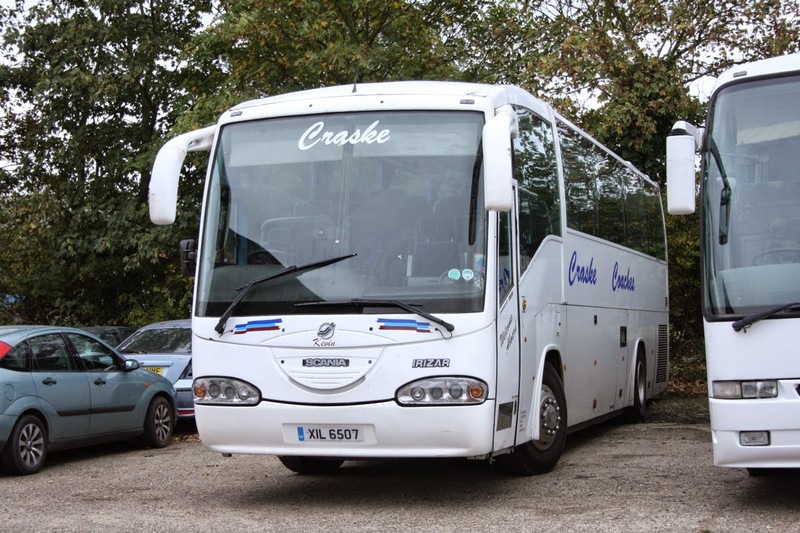 A Small operator tucked away in the Norfolk village of Catfield, Craske has been operating since 1995 run by husband and wife Brenda & Christopher Craske. 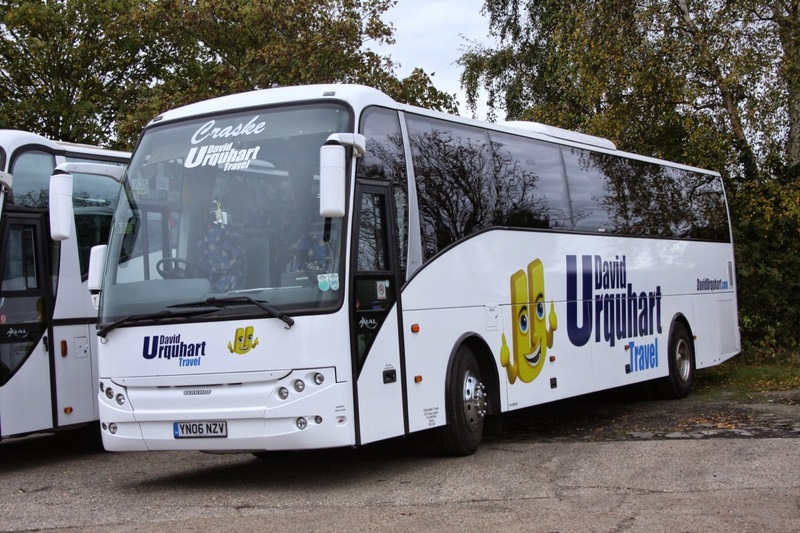 They currently operate Five vehicles, Four of which are executive class vehicles with the other being used for schools contracts in the area. 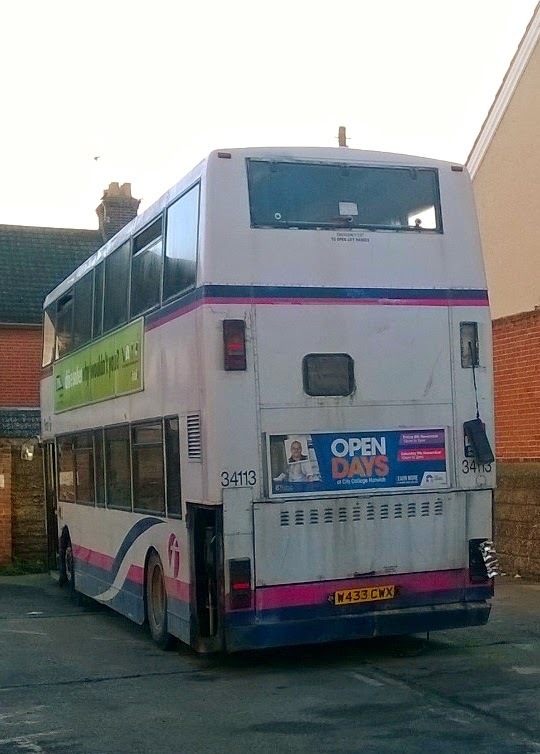 I had a drive up to Sheringham and North Walsham today and stopped in on the way back to Catfield to see what was parked up at the depot on Sutton Road. Scania YN06NZV carries David Urquhart Travel livery and is used for UK and European tours, she was new to Minsterly Motors of Shrewsbury. Another Scania with Berkhof body here is CNZ6130 which was formerly owned by Mainwaring, Tonyrefail in Wales, now in allover White. 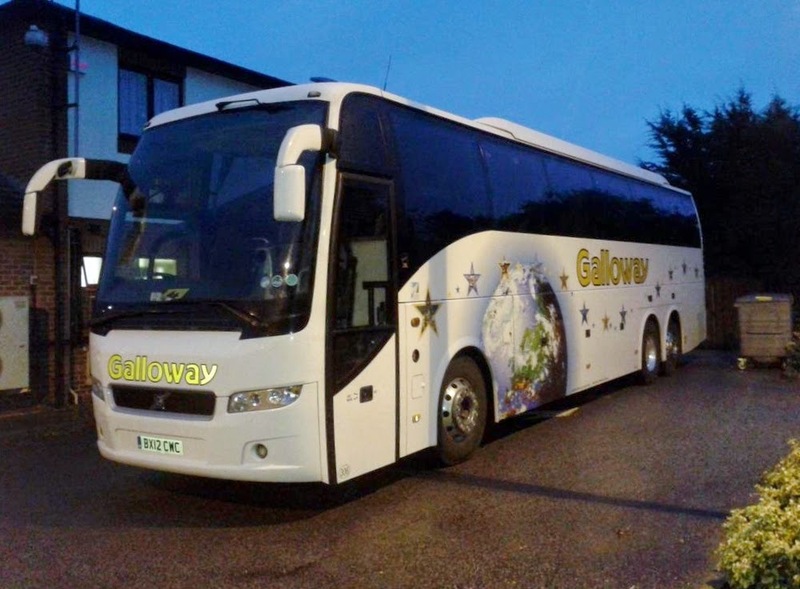 The final vehicle noted today was Scania Irizar XIL6507 which started out as SA02RNE new to Doigs of Glasgow, she also carried V600MAJ whilst operating for Deal Top of Clyst. 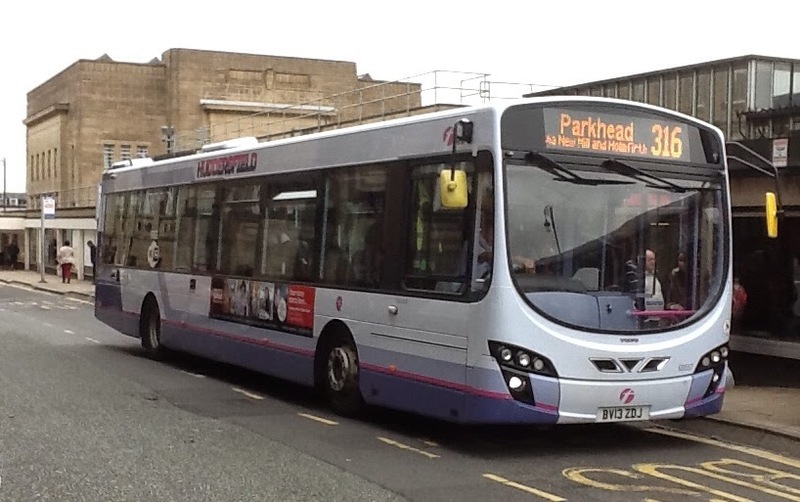 Other vehicles in the fleet are Scania Irizar YN57FWT and DRY640 A Plaxton Paramount bodied classic!